Tactic: Using multiple accounts to tag team to attack others. Yep, James used to be Adelphi making it another case of Adelphi asking/answering on the same question. If you look at the comments count here, you will see it is at 100 (the maximum amount)- you will see that there are now only 73. This is part of the phenomenon I mentioned in this post- that the “messianic jews” are frantically removing incriminating posts as a result of them being featured on this blog! Now that we have established that Adephi and James/Ya’akov are one and the same- let us go back to the main subject of this post: using multiple accounts to try and appear as multiple people to reinforce a POV or attack on somebody else. Well isn’t that strange you liar and slanderer. [Plushy_Bear:]”The latest translations? Not necc. A lot of the later translations have been much better, but to give you a great example of what some others are talking about (misinterpretation), my mom got a replica (certainly NOT the original!) statue of Moshe and he has horns! The original Hebrew/Aramaic is ‘rays of sunlight’, but the Greek mistranslated the 3 root letters of Hebrew into horns. [Plushy Bear:] On the other, she has an entirely different answer starting off with “you’ve gotten some good accurate answers here; showing that your initial hypothesis is incorrect (if the following statements are accurate). I will only add that despite what some individuals believe does not make it so. I know someone personally who calls herself a “JewBu); she grew up in a Jewish household, and is knowledgeable about the holidays, and what not, halachically speaking, if she gos outside the tenets of Judaism and worships anyone/anything other than G-d, she is considered Apostate. You have reached an all time low. Plushy_ bear wouldn’t have changed her answer. G-d forgive your sin-sick soul. People actually looking at the pictures will note that the first one (the current situation) has you asking the question and Yaakov in BA. The second one (the past situation) has the words “BEST ANSWER Chosen by asker” next to your avatar pic. Plushy bear’s picture is below the line in OTHER ANSWERS, just as it is in the first picture! As for your supposed quoted from plushy Bear- truly hilarious! What, did you have fun making that up since it is nowhere in either of the two posted screenshots LOL So aside from trying to convert up your misdeeds- you are actually making things up- what, you going to try claiming next I changed the pictures posted here? LOL. Heh, you really are funny and good for a laugh. Heh, you’d think by now you would learn some honesty instead of trying to defend your atrocious behaviour and reprehensible conduct! Here is the present link to the question showing James Picture, Plushy_Bear saying “Hi James”. You or someone else has used copy/cut/paste and God’s gonna get you BIG TIME for this one. If I were you, I’d rather take me on than Him. I will continue to pray your deceitfullness is turned around, because right now you are in BAD SPIRITUAL SHAPE. Now you’ve even involved innocent Plushy_Bear! Do your lies and schemes know no bounds????? Anyone can see that what you are linking to is completely different to what is posted here! Really, does your dishonesty not have any bounds? Do you think people will just assume you are telling the truth and not click on your link to see that it is a totally different question? It was dark when I woke. This is a ray of suinshne. You are right, I did link to the wrong post. Forgive me for my upset.This is still copy/cut/paste. 5 MONTHS AGO – James gets best answer. 3 MONTHS AGO – You dont show the question. 3 MONTHS AGO – Adelphi gets best answer (Since you don’t show the question, are we implying I answered too? Now today link to Plushy Bears record of the question: Adelphi answers it, James gets best answer again, like 5 months ago. So you cut/copied and pasted. Again/God forgive your sinful soul. Shame, your attempt to try and direct this to another fall apart due to your incompetence again? Heh, it must have been hard for you to have to apologise and try to pretend that it was just an innocent mistake LOL Heh, sorry, you make too many mistakes to pull that one off. No need for any copies of the question- heh, the link to the question as it stands now is right here in the comments LOL And your attempts to try claim I am being dishonest to try and get yourself off the hook is truly hilarious! Shame, you really don’t have any moral fibre or backbone at all, do you? Adelphi’s link, I posted it separately so as not to embarrass. Why not show the question from three months ago, you should have me asking the question and giving the best answer! Make sure it has James getting the best answer 5 months ago since that’s what Plushy_bear has a record of. This is the lowest yet. No need for the link- I already posted it- or did you fail to notice that? LOL Heh, and if you really want the question from three months ago, I will put it up. shame, what you think I post everything I have in my archive immediately? Heh- I wait for your little diatribes and then post the evidence which you demand. I would have thought that you had learnt better by now than to think I make claims I cannot support. Adelphi, it’s official- you’re a liar. And I know everything you sent was a lie. I’ve been following this since it started. I am reporting you to the JDL. I am certain whoever is running this is out to give Jews a bad name. It isn’t about Messianics, though they’re getting a bad rap too. More importantly, MarcC, you to not exemplify Judaism or any of it’s Talmudic ways of returning an apostate Jew to our religion. In a twisted way, this is done to badly reflect on upstanding Jews eveywhere. New trick. Who set you up to do it? You’re being reported to the JDL. Go ahead and report me- they are most likely to give me a medal! They should have a good laugh at the antics of the “messianic jews” that have been highlighted here. Heh- and your other comments show you to be completely ignorant of what the Talmud actually says. Go read masechta Sanhedrin and masechta Makkos and see what it says about the meizid. See what the Rema says in Yoreah Deah about the Jew who converts to another religion; go see what Ramban says in Mishneh Torah in Hilchos Avodat Kochavim. If one takes the URL present in the screen shot that shows Adelphi as getting the BA and bothers to type it in it goes to the question that now has Yakov as BA. However, the REAL question is..how can Adelphi make claims for someone *else* to have a “record” of the BA at the time being awarded going to James, because at that time..as the comments clearly show, others addressed the account then awarded as BA by screen name..more than one person. ..even Adelphi’s good friend Devoted 1’s praise to her of the awarding of the BA to…the *person* who answered it and was awarded BEST ANSWER was BLUESTEIN. When the Bluestein account was seen morphing into the Adelphi account, several of us made screen shots of this question when we saw it change from Bluestein to Adelphi..as we’d already noted that Bluestein was openly antisemitic. I had NO idea it would morph into JAMES! I thought there were two people involved on that q. Lynne E, Beth, Wendy, Myra, Adelphi ( all names used by the account asking, and it was Myra at the time asked) and Bluestein..then I realized Adelphi was also Bluestein. I didn’t yet know Adelphi was also James until the next change. 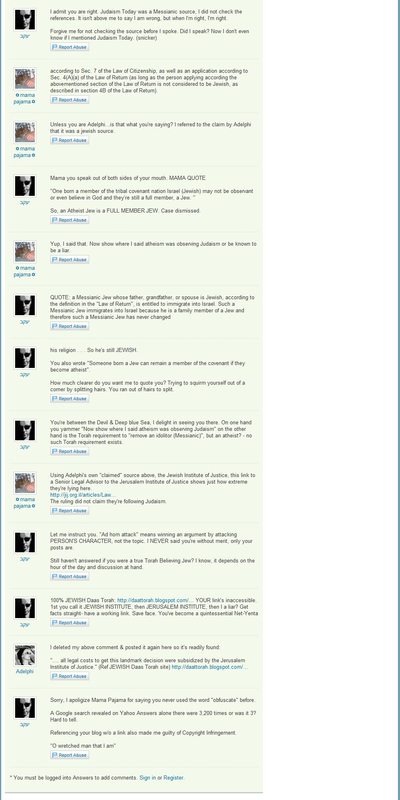 Making a screen shot of bad behavior a while back when evidence began to mount of the rapidly changing identities a few months ago and not posting it until evidence came forward to utilize them to prove what was only hinted at or seen as it happened and was then removed certanly is no evidence of bad behavior on allonyoav’s part. Adelphi /Papa P/ Yaacov/ James/ a million other people- when will you stop? First you email me (100000000 times), and tell me you’re sorry, and all that BS (excuse my language), and then start trolling and cheating. Now, this just shows the validity of this blog (site?)! 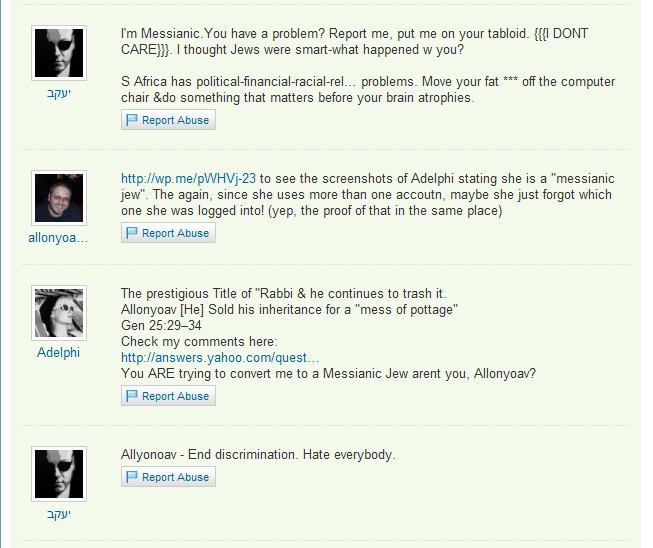 Amazing, now we know that you’re a faker and a liar, and that you represent all you’re “messianic ‘jewish'” friends. In actuality Bluestein has always had his q&a unbocked! He’s known as Litigating now. I don’t find him/her on any of the long comment wars, and he/she? has a history of only posting and answering less than 5 times! Pretty, pretty, pretty hard to prove someone to be antisemitic with so few posts and comments. I keep track of those things too. 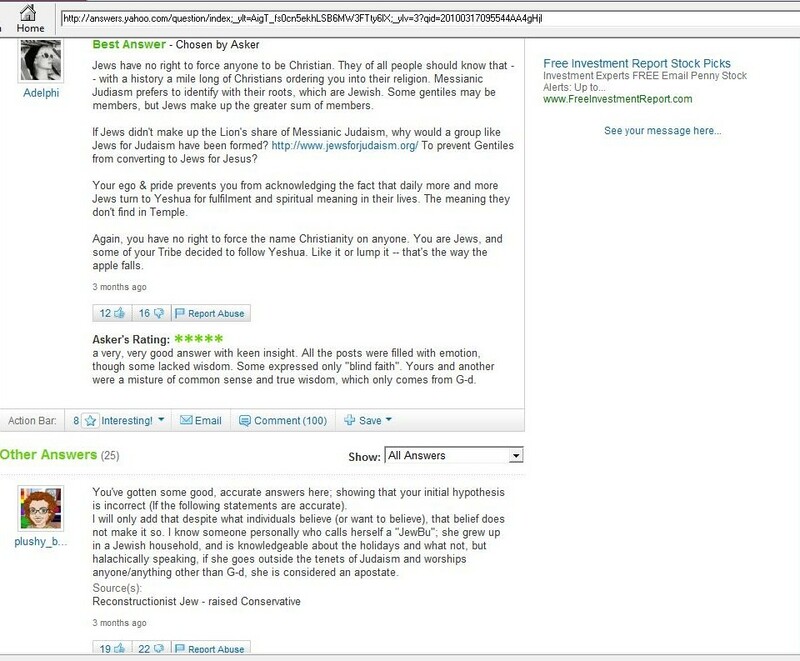 I haven’t seen one post from Bluestein that was anti-anything except for posting they believed in Messianic Judaism. That was it. AND, unlike me, their questions have been and still are open for anyone to view. http://answers.yahoo.com/my/my;_ylt=AkukhrYZOfUX2S2CjBB9uO7j1KIX;_ylv=3. They have 2 questions and 2 answers and 104 points! MAMAPJ, it’s hard for someone to take you seriously when you dream up such unbelievable things. Me thinks you’ve been hitting the Manischewitz a bit too much. You’re as crazy as me! I’m in Israel doing this at 4 a.m. in the morning. Both you and Marc need a religious experience. I’ve never read anywhere what G-d has done in your life. So sad, so very sad. Heh- Adelphi truly is desperate to try and sanitise her image. What is funniest is that she is unable to offer any counter to the facts presented. Heh, and then she gives a link that just brings up your own profile! 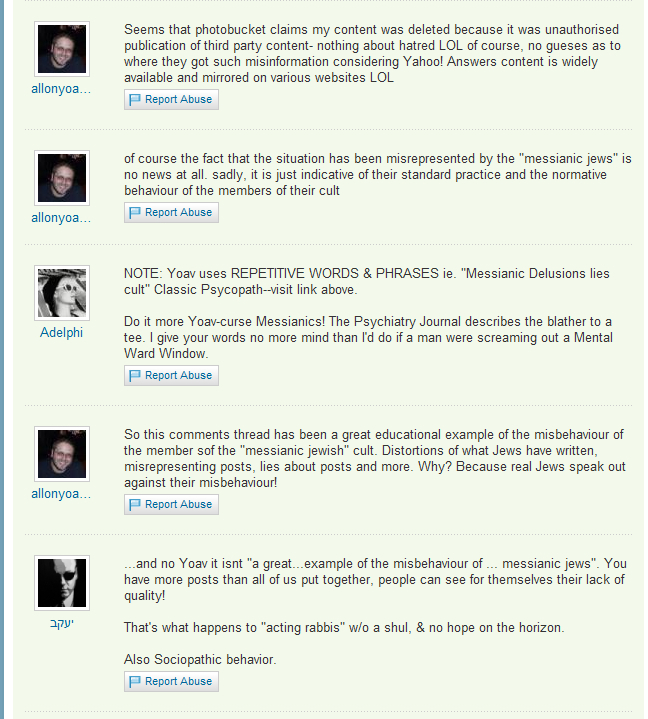 Playing musical chairs with screen names of Adelphi’s different accounts has already been shown by allonyoav here. It reeks of failed desperation to claim I’m talking about a different one of Adelphi’s accounts ( Litigating), other than the one that others addressed at the question that remains the topic of this thread. I realize she removed the comments addressing those who called her Bluestein, but other’s comments addressing her by that name remain as of this point in time as I noted. You asked the question as Bluestein, insulted ambivalent as Bluestein, made more than twenty comments as both Bluestein and Myra ( the answerer) and then they later both showed up as Adelphi. Those are facts in evidence by both the screen shot of the question two months ago and another more recent. Switching account names or having more than on account you’ve used called Bluestein isn’t any different than the 3 Adelphi accounts I’ve got showing in my block list currently. It isn’t any more “unbelievable” to think you’ve had more than one Bluestein account than to see more than one James/Yakov account or more than one Adelphi account. It *is* hard for me to fathom the level of obsession with Jew hate required for someone to create many different personas to harass Jews, individually and collectively though. I’ll pray for you to seek help for that problem while you’re in Israel. Mama, I come here today and find the original post by you and my answer of last gone erased and this appearing. Guess that is one of the perks of knowing the blog’s originator. Let’s refer to the account you call Bluestein/aka/Adelphi/aka Litigation. We’ll play the game. The bible says god will bless those who bless Israel and curse the who curse Israel.? Who is the founder of ‘messianic judaism’ and what is his/her religion? Who stoned Stephen in the bible? Are there any groups for Jewish people who want to know more about Jesus? I see no antisemitic posts or comments there, even though the comments on one are 100 and none could have been removed. Please back up your allegations, since I’d like to have proof that Litigation/Bluestein/Adelphi etc. Were antisemitic on this account. I don’t think you can do it and it will be fun to see what you come up with! I have no time for this silly business and am going to eat a peaceful meal. Really Adelphi, you shouldn’t lie so much! The last comment you posted is right there with you saying how you need to work on yourself not to come back here! LOL Shame, you can’t help but lie can you? As for Bluestein/Litigating- I’m sure you’ll be happy to know that some of the 27 comments that were deleted from that question were captured in screenshots before they were deleted. Don’t worry, they’ll be posted soon. Here I found a post with Bluestein – still no antisemitism. It is on Rockland. What’s the problem here? I’m coming up with more precise info than you Mama! They didn’t even make one post on the comments (???). Thankfully, much of your antisemitism on Y/A has been disappearing since Allonyoav has been showing what you’ve been up to with so many different accounts. Your answer to one question that you had only responded with a link to the stormfront site is gone, however your link to realzionistnews on another question remains. I believe that has already been shown somewhere here on his blog. If a post of yours is gone..perhaps you can repeat it and he will repost it. The original post by me? Everything I submitted to this blog thread is showing. I only see that you’re desperately avoiding facing that you have been exposed. You were praised as Bluestein on the question that is the TOPIC of the THREAD..not the other multiple accounts that you also play musical avatar/screen names. 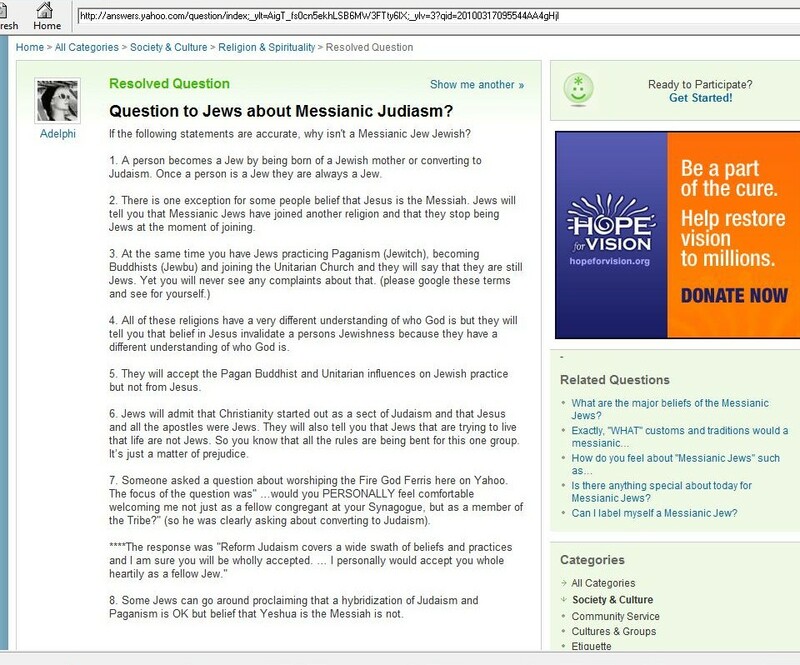 It is “Question to Jews about Messianic Judaism” if you are of short term memory. Just look at the beginning of this thread. That’s where you were called Bluestein and responded as Bluestein at the time of the question five months ago. Let me once again refocus on the obvious evidence before us all, rather than on the always deceptive unsubstantiated smokescreens of deflection from Adelphi involving projection. The “Rockland family service” site is one of the many blogs or mirror sites who lift Yahoo questions, answers and our identities without permission from the users. They don’t post the comments that appear after closed questions. There are some comments showing under the question in Yahoo Answers it was lifted from. ( currently 4) comments to closed questions in Yahoo can be deleted and reposted at any time. Some of those “mirror” sites do not even show which question was chosen as best answer. Anyone “googling” can often find old cached questions of theirs all over the internet on some very strange places. Sometimes the person who lifted the entire question and answers will also add their own new answers to what was a closed q on Yahoo. When someone has changed their ID in Yahoo Answers it does not alter what others copied before the name change. When names are changed by a user in Yahoo Answers, all past questions show that name change. Name and photo changes can happen many times. There isn’t a thing wrong with changing a screen name or avatar photo, even daily if that’s your cup of tea. What is wrong is to point game, create many accounts to gang up on people, to harass and misrepresent yourself for the purpose of libeling others. Nice memory and catch, allonyoav. I notice how other accounts on that question have also changed LOL..hmmm…lol. Another interesting thing..Adelphi/Bluestein gives a LINK at the one she exposed HERSELF as both accounts here in her answer..to the question that is the very topic of this thread. Oh what a twisted web you weave when first you practice to deceive! I was also laughing when I clicked on that first link Adelphi claimed would show a Bluestein account and immediately recognized that the *only* way Adelphi could be viewing a Bluestein or Litigation (or whatever she’s renamed it to be) account with THAT particular link .. (and this is known obviously to anyone who uses Yahoo Answers)..is if you are looking at your own open account! LOL!!! Way to go! If you are not logged into Yahoo when you click on that link, it takes you to a log in page. If you had a link to an actual profile, you do not need to be logged in. That link only shows a profile if you are LOGGED in, and it only shows the profile you are logged in! Any person posting here who changed their avatar was less than bright, but it’s really no big deal calling for this type of retaliation. Of greater disgust is the wording of those apposing supposed Hebrew Christians a.k.a. Messianic Jews. Some of this reads like a trash novel “rot in Jesus’ hell”. What you say and how you say it speaks much louder than avatar/id changes. Personally I’ve read over these posts often and find the only offensive wording to be of the ones calling themselves Jews. It must be some kind of internet cult, I’ve never met anyone from any branch of judaism so consumed with hate, except on this blog. So you don’t like someone changing their ID, you rake them through the coals? Their posts are actually intelligent and articulate, far more so than the rest. Shame, maybe one day you’ll learn words like “ethics”‘ “morality” and “honesty”? Heh, as for you calling their posts “intelligent and articulate”- well, that says as much about you than your inability to understand why people object to the dishonesty and lack of ethics shown by these posters! Mama Pajama, I don’t know you but found this blog through your blog whic I stumbled upon. I noticed you were a fan of MarcL@yahoo.com and ended up here. You come off as a self righteous know it all, sorry but you do. Don’t know much about adelphi, but she is beautiful inside and out, intelligent too. Right now she’s in the lead, no matter what her religion is! Really Thomas, you shouldn’t make things up- I don’t own the email address “marcl@yahoo.com” I do have allonyoav@yahoo.com though LOL Shame, you trying to invent a way that you got here without admitting one of your “messianic jewish” cohorts told you to come here to try and defend their dishonesty? heh, and if you call deceitful, dishonest and a complete lack of ethics “beautiful inside and out”- well, I’m glad I’m not in your circle of friends! Karma is real. It’s like a boomerang. What you set forth in life, returns to you. Strange how this is playing out. The winners in the intelligence and intellect level are those Jews who found Jesus. Not myself, but I see the lacks of ethics here. You’re actually chasing searchers away from your brand of Jewishness into the willing and safe arms of the Jewish believers in Jesus. Who but a fool would make such a fuss over ID changes. Happens all over the internet. Your words will come back to haunt you. That’s Karma. Seems most of you are doomed for a life that will not be peaceful or harmonious. “Life does not stand still for long. All of life is a cycle of motion and rest. We grow, we push ahead, we exert ourselves, we rest, and then move forward again”. Unfortunately many here have a life formula that will move you back, back & further back. Sad. Heh, of course they are the winners! LOL And we know that because so many “messianic jews” take time out to tell me that this blog is irrelevant and that they are winning. ROFLOL Sigh, I must thank you and your fellow “messianic jews” for the laughs- especially when you insist on shooting yourself in the foot! 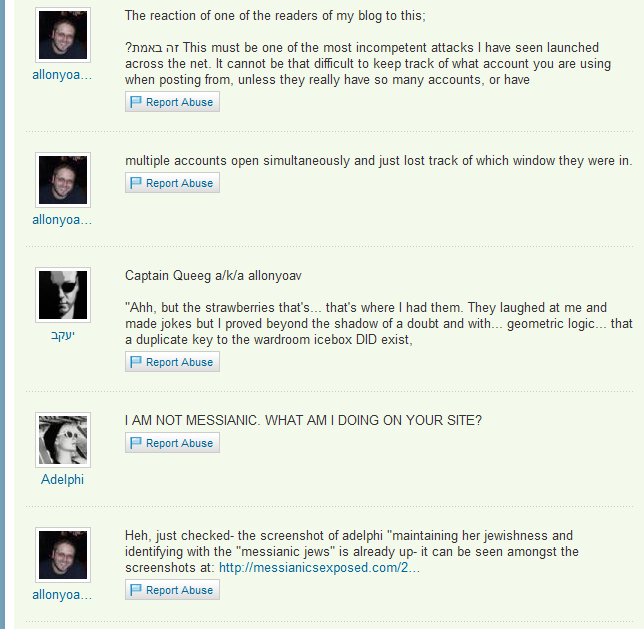 Really, Adelphi was truly funny here posting a link that showed her dishonesty and revealing yet another ID. Shame, the desperation and need for self aggrandisement revealed through asking a question- and then answering your own question so you can choose yourself for “best answer”! That truly says more about her than anything I could write! Sorry, it is absolute rubbish- nothing worthwhile listening to. Now the shiur on masechta Niddah I am currently listening to on my IPhone by R’ Eisemann is far more informative! Thanks for your opinion Mamaj but you’re wrong. The reason I’m not on Yahoo Answers is because #1 I’m away. #2 Not many questions have been asked about Messianic Judaism. If more are asked you’ll hear my side of the story strongly (like you don’t like it again). I’m not an anti-semite which would mean I’d hate myself, my husband and all his family. I actually have much love for the Jewish people, especially more now that I’m in Israel. I learned much on Y/A – what sites were not good, where I went ignorantly that I regret and even some things I said where I was wrong. Doesn’t matter now. I’m convinced of one thing. If left to my experiences here, I’d never in a million years return to Judaism proper. It’s been a terrible experience. I’m sorry I ever passed your crude paths. Nevertheless, I’m in Israel where real Jews are, I feel the love and it makes me even more certain that you are not what you say you are in your heart “Jewish”. No Jew talks or acts the way the ‘group’ does here. What you are I haven’t figured out yet, but the beauty of Judaism is absent from most of your hearts as evidenced in your written words. It’s already way passed my bed time. Good night. Call me anything you want, DMS, the Clown of Righteousness, Shay, Adelphi, James, Devoted, etc. etc. In most instances you’re so off base it isn’t even funny. It’s a mystery you’ll never solve but I know what the answer is, and I have nothing to be ashamed of. Repent, Yom Kippur is around the corner. Wouldn’t want to be in the spiritual states ya’ all are now on the High Holy Days would ya? Just for the fun of it I think I’ll change my ID and avitar every day now. LOL! Ah yes, your next howler is your claim that you were considering returning to authentic Judaism- heh, which ID was that? James? Yeshua? Bluestein? Adelphi? One of the many others? Heh, and if you think we’re harsh in our condemnation of “messianic jews”- you haven’t read enough of your friend (or is that also you?) 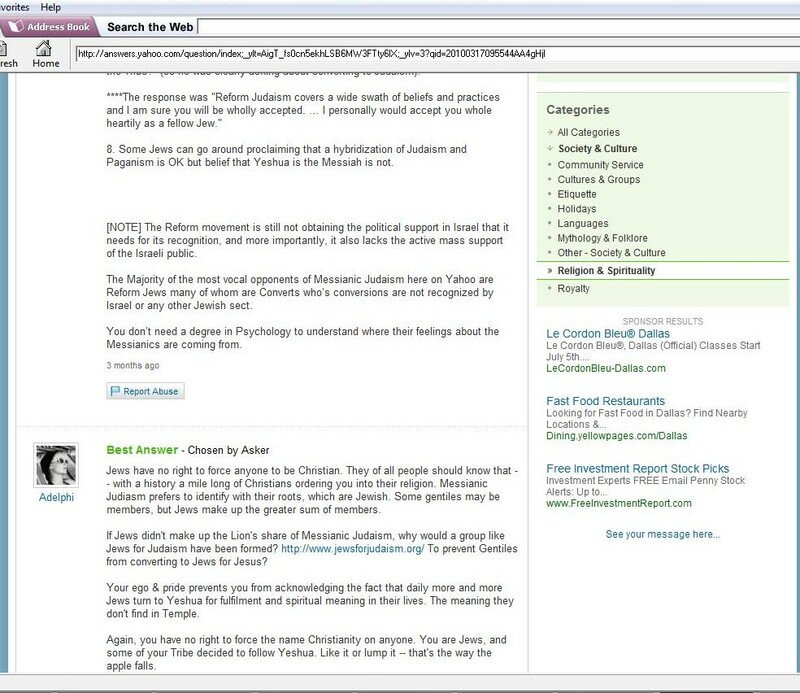 Joshua’s website and how much hatred and dislike the “messianic jews” in Israel receive from the Jewish population! Really, if you think “messianic jews” are warmly received you must be in a very insular “messianic jewish” environment, or not in Israel at all! I do not see any question from *anyone* asking Adelphi why she isn’t answering questions in Y/A, but I do see that once again, she has done nothing to address or apologize for the bad behavior exposed and what was actually said or asked. I’m sounding like a broken record here to once again not she also evades with personal insult and projection of her own behaviors and attitude displayed. Of course it is a very weak strawman already blown down before it was brought out again to claim Adelphi was pointed out *just for changing a screen name and photo! * LOL. The issue is multiple account abuse posing as different people under single questions and comment threads to ATTACK others. She’s clearly showing her purpose is to create hatred of Jews, misrepresent Judaism and harass others in nefarious behavior. She has used different accounts posing as *different people* to point game, to post personal attacks, insults and lies about Jews for the sole purpose of creating hatred of Jews, keeps denying it, but the evidence keeps mounting up to prove it..even provided here for all to see by herself with her very own links. Then we have another glitch in the matrix showing up to make more unsubstantiated ad hominem insults of those who exposed this and even claim he arrived here by way of a non existent link on my blog. Claiming that it is *me* engaged in bad behavior isn’t a good reflection on that person making that false charge. I have links to Rabbi Stuart Federow’s page and to two from Zvi the Fiddler, two other well respected Jews, another to the Southern Poverty Law Center, and then to the Interfaith Alliance, on my blog. That’s it. 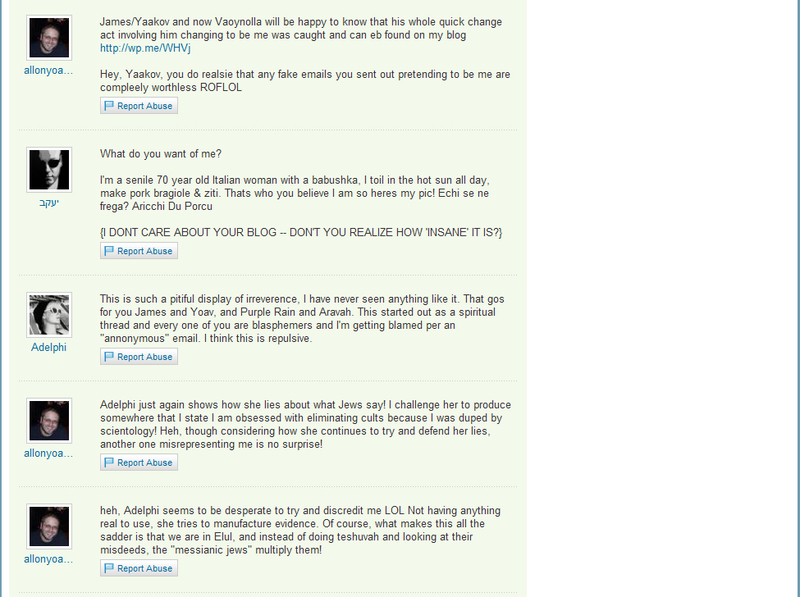 I don’t link to Marc’s blog at all on mine. I’ve thought about it, but never got around to asking. I don’t have any “fans” showing as connected to my blog or vice versa, and I am not connected to anyone that I am aware of who has an email of “MarcL@yahoo.com” . The signature of someone who makes such an unethical claim and then misuses Jewish values to project is the epitome of hypocrisy. Hey, what if I called judaism material “absolute rubbish” and you say someday I may learn ” “ethics”‘ “morality” and “honesty”? That was my religion you were talking about. As far as your email went, it was your blog address I confused it with marcL…..
Are you out to condemn all religions including the Ethical Culture Society? What’s your problem? Gee, where did I ever attack the ethic culture society? Though if you represent that- one wonders what kind of ethics they represent since you see nothing wrong with the unethical behaviour of some “messianic jews” on Yahoo! Answers that I have highlighted here! If that link was your religion- then think twice before posting it and telling people who believe in other religions to listen to it! You don’t like people saying what they think of it- then don’t post it. There is no reference or link to allonyoav’s blog from my blog. The claim from Thomas was that he *found his way here* from MY blog and now he wheedles, “As far as your email went, it was your blog address I confused it with marcL”….. I do not have this blog connected to mine in any manner. It’s also a strange stretch to “confuse” the name of a blog (Messianics Exposed) with a typed out email address that has neither of those things in it. 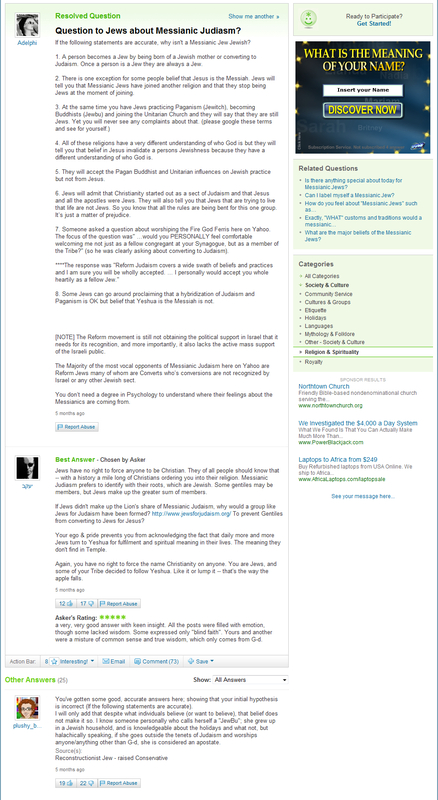 However, the important point is that here is no link to allonyoav’s blog on my blog and I have no connection to any MarcL@yahoo so it is indeed unethical and dishonest to claim that you arrived here through the means you claimed. I give no link, no mention of his blog, or that he even has one. What’s that current catch phrase again? Hey, Thomas- I gotta agree with R’, because Gemara Niddah is pretty hard… That garbage (he called it “”rubbish”) is not interesting and is pretty dumb. Maybe I’ll start learning Gemara Niddah!